This is the sixth in my monthly series of Alliums for the Month posts, which run from May to April. Plant shallot bulbs between October and November, if your winters aren’t too cold. Mulch them well. We tried to over-winter replanted shallot bulbs, but we got lots of winter-kill. To save bulbs for replanting in early spring, refrigerate them. You can alternatively start shallots from seed in late January in zone 7 and plant in spring. 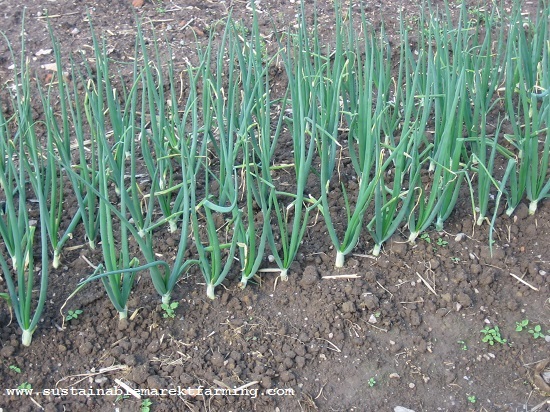 Divide & replant Egyptian onions & perennial leeks September-November. Plant perennial leeks from dry bulbs a month earlier than divisions: August-October. Perennial leeks take 9-12 months to grow to a good size. Common leeks are Allium ampeloprasum var. porrum. 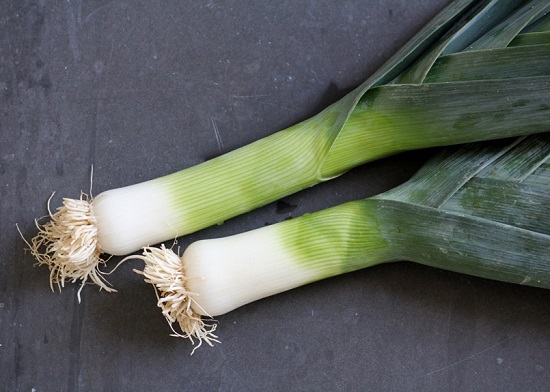 Leeks come in two main types: the less cold-hardy, faster-growing fall varieties, often with lighter green leaves, which are not winter-hardy north of Zone 8, and the blue-green hardier winter leeks. In the first category, we like Lincoln (50 days to slender bunching leeks, 75 days to mature leeks), King Richard (75 days, fast-growing) and Giant Bulgarian. American Flag has not worked well for us. Giant Musselburgh (105 days) is bolt-resistant, for overwintering in milder climates. For winter leeks we like Tadorna (100 days), Jaune du Poiteau, King Sieg (84 days, a cross between King Richard and the winter-hardy Siegfried, from Fedco) and Bleu de Solaize (105 days, very hardy). Leeks can be harvested whenever they seem big enough. To feed a hundred people, we like to have one bed of 1080 leeks for harvesting each month, from October to February. We grow two beds of fall leeks and three of winter-hardy ones. About ten leeks each, each month. When harvesting leeks, remember how deep you planted them and try to avoid spearing them. Put the tines of a digging fork (spading fork) vertically down in the ground 2″–3″ (5–8 cm) away from the leeks. I try to dig up two at once for efficiency. Step on the fork and lever back until the leeks move. Impatient pulling of unloosened leeks leads to broken ones. Remove one leek, chop off the roots, invert the plant and cut the leaves in a V shape, so that the tougher outer leaves are shortest and the younger inner leaves are longest. Clean up any obviously inedible outer layers, then put the leek in a bucket. We put an inch (2.5 cm) of water in the bottom of the bucket (to keep the leeks hydrated) before taking the leeks to the cooler. 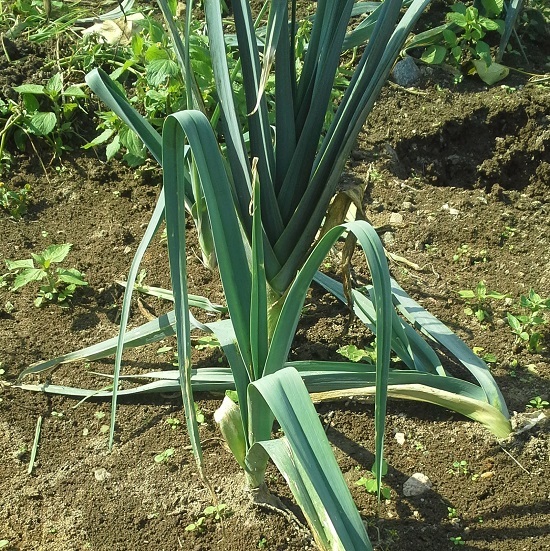 If the ground is frozen too deep to pierce the crust with the fork, you may be able to harvest a few leeks for immediate use by pouring boiling water along the row at the base of the plants. This does not seem to damage the leaves. Read about the early summer task of planting leeks here. Harvest and eat large perennial leeks, and leaves of Egyptian onions and smaller perennial leeks September –April, whenever they are large enough. Eat the non-storing onions and the hardneck garlic first. Sort through your bulb onions once a week or so, removing any that are having troubles, before the trouble spreads to other bulbs. Then work your way through the non-storing varieties such as Ailsa Craig, Walla Walla, etc. Regular bulb onions are a biennial crop grown as an annual (A. cepa var. cepa). This botanical group includes bulb onions, scallions (spring onions, salad onions or escallions), and the small pickling onions (cipollini). In our location the best time to sow bulbing onion seed is early November in our hoophouse. After over-wintering, we transplant them outdoors at the very beginning of March. (More on sowing onions next month.) If you want to sow in November as we do, now is the time to choose varieties. Factors include latitude, temperature, flavor preference and whether or not you hope to store onions or only grow for fairly immediate eating. Onions have three separate phases of growth — vegetative, bulbing and blooming — and the switch from one phase to the next is triggered by environmental factors, mostly day-length and temperature. To grow large bulb onions it is important to produce large healthy plants before the vegetative stage gives way to the bulbing stage. If plants are small when bulbing starts, only small bulbs can result. Be sure to choose varieties suited to your latitude, because onions are daylength sensitive. Varieties are classified as short day, intermediate day, or long day types, depending on the daylight length at which they start forming bulbs (assuming suitable temperatures): 10-12 hours, 12-14 hours, 14-16 hours. Onions bulb earlier at warm temperatures than at colder temperatures. More catalogs are now including the information on the latitude adaptation of their varieties. The further north you are, the more hours of daylight you have in summer. Here, our longest day (summer solstice) has 14 hours and 46 minutes of daylight. We have 14 hours of daylight six weeks earlier, on May 6. A few varieties of long-day onions can be grown here, but those requiring 15 or 16 hours of daylight will never form bulbs at this latitude. South of their ideal growing region, long-day onions don’t start bulbing until triggered by the very longest days (near summer solstice) and the bulbs get too hot in July as they mature. Short-day onions start to bulb at 10–12 hours of daylight, provided temperatures are warm enough. 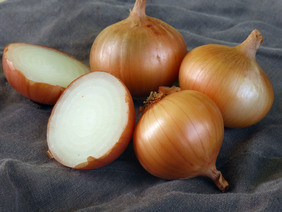 If short-day onions are grown too far north (where it is too cold to overwinter them, and they must be started in spring) they will bulb before much leaf growth has occurred, and so the bulbs will be small. At our latitude (38°N) neither long-day nor short-day onions are ideal. The trigger for the transition from bulbing to flowering (bolting) is temperatures below 50°F (10°C) for three to four weeks, after the plants have six leaves or more (pencil size). This is especially true when rapid growth is followed by a period of cool weather. The chilling effect appears to be cumulative over time. Hence you can see that to avoid bolting it’s important your seedlings don’t get too big too early in the winter. And that you give them extra protection if there is a long cold spell in spring before you plant them out. Daylength does not affect bolting. For us to succeed with bulbing onions we need to produce transplants the thickness of thin pencils (⅜” or 1 cm) on March 1, our earliest possible date for planting outdoors. This gives the plants time to grow large before bulbing is triggered. 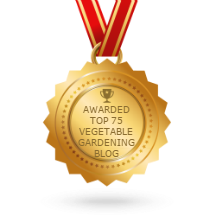 Starting from seed in January didn’t give us time to grow big vegetative plants, therefore not big bulbs either. Starting plants in the fall and keeping them in coldframes or outdoors under rowcover gave us too much winter-kill. Once we discovered the method of using our hoophouse to keep little onions alive over the winter we were very happy. We have sown bulbing onions for growing to maturity in the hoophouse, and, more often, we have grown onion seedlings for planting outdoors. “Days to maturity” numbers in catalogs are generally for spring planting once conditions have warmed to the usual range for that crop. When growing late into the fall, add about 14 days for the slowdown in growth, and when growing over the winter, precise calculations go out the window! 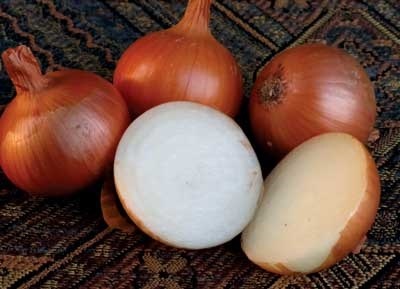 Beware of white onions, which can get sun-scald, if growing them to maturity in a hoophouse. We have to accept that hard storing onions cannot be grown in the south. At 38°N, some varieties that worked well for 6 month storage for us include: Gunnison, Frontier, Copra as the best three, then Patterson (Hybrid. High yield potential. 38°–55° latitude) and Prince. Prince has since been replaced by Pontiac, a large onion with strong skin, thin necks, suitable for 36°–50° latitude. We had only 50% success with Red Wethersfield and Cabernet. Some non-storing good ones for us include Ailsa Craig (OP aka Exhibition. High yield. Large. 33°–40° latitude), Walla Walla, Olympic, Bridger (Hybrid. Replaces Olympic. 35°–50° latitude), Expression. Varieties come and got. Australian Brown is one that sounds good, but I have not tried it. See Sustainable Market Farming for more on onions in general, including diseases. 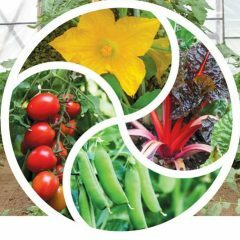 See the Texas A&M AgriLife Extension publication Onion, by Joe Masabni. I don’t endorse the chemical pesticides mentioned, but the information on growing onions is very sound.